February 1, 2017 Computations in Science Seminar: Joshua A Frieman, "The Dark Energy Survey"
February 9, 2017 C2ST Public Lecture: Edward W. Kolb, "From Quarks to the Cosmos"
February 20, 2017 EFI colloquium: Leslie Rogers, "The Diversity and Demographics of Distant Rocky Worlds"
February 28, 2017 Daniel Holz, "Gravitational Waves"
March 10, 2017 Society of Women in Physics: Dr. Kawtar Hafidi, "A Personal Odyssey: From Africa to America"
March 29, 2017 Rocky Kolb and Michael Turner: "How Fermilab changed the course of cosmology"
April 8, 2017 Film Screening and Discussion: "Hidden Figures"
April 12, 2017 Astronomy on Tap: Zoheyr Doctor, "100 Years in the Making: The Detection of Gravitational Waves"
April 17, 2017 Cafe Scientifique: Abby Vieregg, "Turning a Continent into a Telescope"
April 24, 2017 EFI colloquium: Adrienne Kolb, "Tunnel Visions: The History of the Superconducting Super Collider"
April 25, 2017 Nergis Mavalvala, "The Warped Universe: the one hundred year quest to discover Einstein's gravitational waves"
May 3, 2017 Computations in Science Seminar: Daniel Scolnic, "Measuring the size of the Universe with Standard Candles"
May 31, 2017 Dr. Thomas Zurbuchen, NASA Associate Administrator for the Science Mission Directorate, "NASA Science Missions"
June 20, 2017 Michael Turner, "The origin of our universe: what we know for sure and the big mysteries"
On Martin Luther King Day, 2017, students from the Cosmology Club at Dr. Martin Luther King Prep High School will visit KICP to learn about current dark matter research and tour the lab facilities. 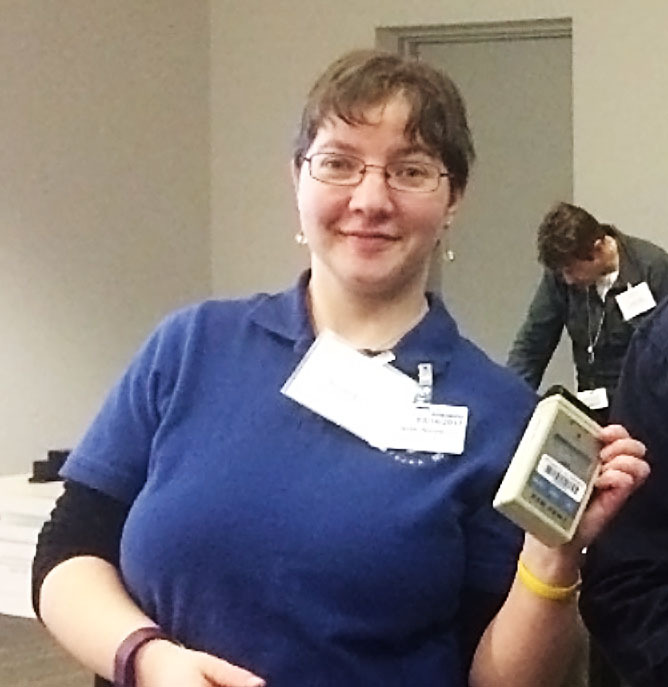 The instructor of the club, Nora Wengerski, has been working with KICP Professor Luca Grandi and his group for several months, including a week-long research experience in the summer of 2016 and developing the curriculum for the King Prep cosmology club, which is in its inaugural year. 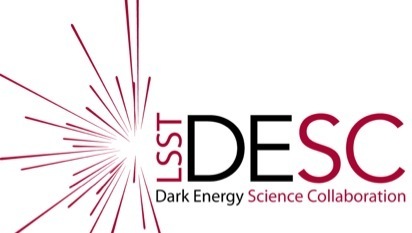 Computations in Science Seminar: Joshua A Frieman, "The Dark Energy Survey"
I will overview the Dark Energy Survey (DES) project, highlight its early science results, and discuss its on-going activities and plans. The DES collaboration built the 570-megapixel Dark Energy Camera for the Blanco 4-meter telescope at Cerro Tololo Inter-American Observatory in Chile to carry out a 5-year, deep, multi-band, optical survey over one eighth of the sky and a time-domain survey that will discover several thousand supernovae. The survey started in Aug. 2013 and is now nearing completion of its fourth observing season. 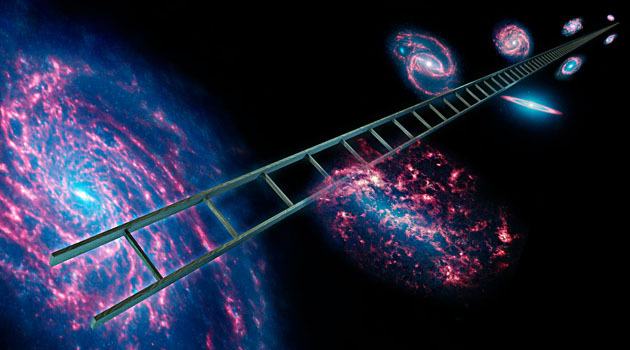 DES was designed to address the questions: why is the expansion of the Universe speeding up? Is cosmic acceleration due to dark energy or does it require a modification of General Relativity? If dark energy, is it the energy density of the vacuum (Einstein's cosmological constant) or something else? DES is addressing these questions by measuring the history of cosmic expansion and the growth of structure through four complementary techniques: galaxy clusters, the large-scale galaxy distribution, gravitational lensing, and supernovae, as well as through cross-correlation with other data sets. 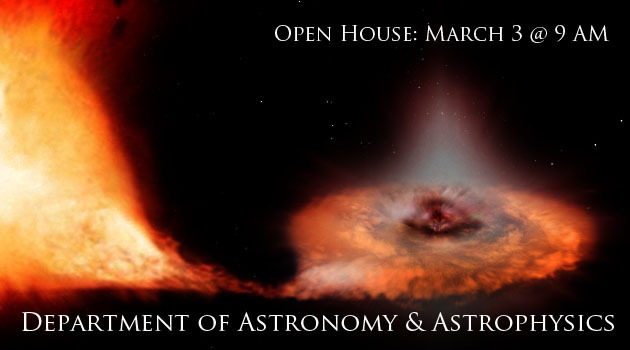 I will also discuss how the data are being used to make a variety of other astronomical discoveries, from our Solar System to the most distant quasars. C2ST Public Lecture: Edward W. Kolb, "From Quarks to the Cosmos"
For the first second of time, long before the emergence of planets, stars, or galaxies, our universe was a hot primordial soup of "elementary" particles like quarks. Encoded in this formless, shapeless quark soup were the imprints of events from an even earlier epoch---the very beginning of the universe. Over the last 12 billion years, the primordial soup has cooled and condensed into the rich cosmic structure we see around us in the universe today. We can learn the nature of the primordial soup by studying relics from the early universe, and we can uncover the ingredients of the soup by cooking up a little bit of it in the laboratory. Edward W. Kolb (known to most as Rocky ) is the Arthur Holly Compton Distinguished Service Professor of Astronomy & Astrophysics and the College and Dean of the Physical Sciences at the University of Chicago, as well as a member of the Enrico Fermi Institute and the Kavli Institute for Cosmological Physics. In 1983 he was a founding head of the Theoretical Astrophysics Group and in 2004 the founding Director of the Particle Astrophysics Center at Fermi National Accelerator Laboratory in Batavia, Illinois. Kolb is a Fellow of the American Academy of Arts and Sciences and a Fellow of the American Physical Society. He was the recipient of the 2003 Oersted Medal of the American Association of Physics Teachers for notable contributions to the teaching of physics, the 1993 Quantrell Prize for teaching excellence at the University of Chicago, and the 2009 Excellence in Teaching Award from the Graham School of the University of Chicago. His book for the general public, Blind Watchers of the Sky, received the 1996 Emme Award of the American Aeronautical Society. The field of Rocky's research is the application of elementary-particle physics to the very early Universe. In addition to over 200 scientific papers, he is a co-author of The Early Universe, the standard textbook on particle physics and cosmology. Kolb's research was recognized by the 2010 Dannie Heineman Prize for Astrophysics, awarded by the American Astronomical Society and the American Institute for Physics. He holds an honorary degree, Doctor Honoris Causa, from the University of Lyon, France, and was the recipient of the J. Hans D. Jensen Prize of the University of Heidelberg. He has traveled the world, if not yet the Universe, giving scientific and public lectures. 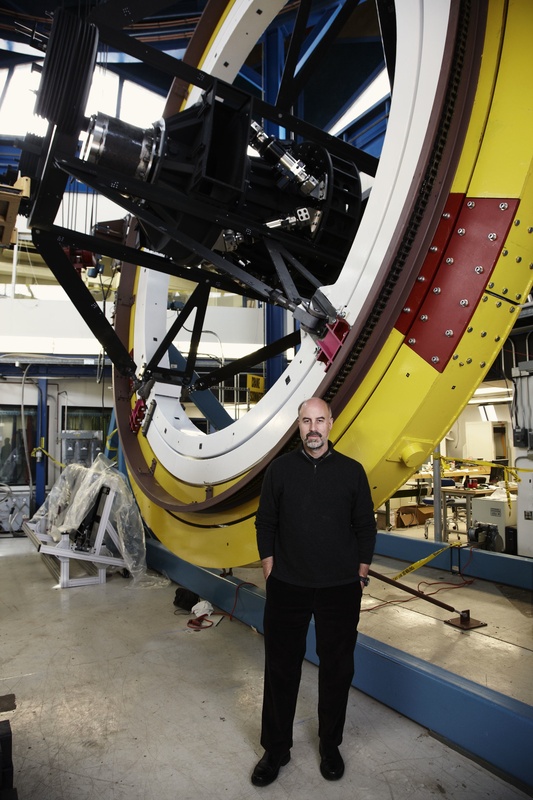 Rocky has been a Harlow Shapley Visiting Lecturer with the American Astronomical Society since 1984. In recent years he has been selected by the American Physical Society and the International Conference on High-Energy Physics to present public lectures in conjunction with international physics meetings. Rocky presented a special public lecture in Salonika Greece as part of the cultural celebration of that city, and he was selected to address the president of Pakistan as part of the celebration of the 50th anniversary of the founding of the country. He has been the Oppenheimer lecturer in Los Alamos, and in Athens (Ohio) and Troy (New York) he presented the Graselli Lecture and the Resnick Lecture. He has also presented public lectures at the Royal Society of London, as well as Vienna, Barcelona, Rio de Janeiro, Glasgow, Edinburgh, Valencia, Victoria, Montreal, Bonn, Heidelberg, Munich, Karlsruhe, Rome, Toronto, Copenhagen, Turin, Madrid, Bejing, Uppsala, Hamilton, and Vancouver. Rocky has appeared in several television productions, most recently interviewing Stephen Hawking for the Discovery Channel. He can also be seen in the IMAX film The Cosmic Voyage. Dr. Kolb's lecture is a geared toward the public, and is a part of Quark Matter 2017, the XXVI international conference on ultrarelativistic heavy-ion collisions. 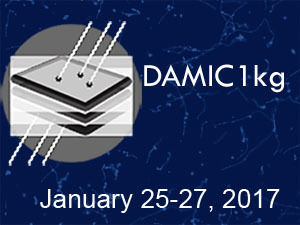 The conference brings together theoretical and experimental physicists from around the world to discuss new developments in high energy heavy ion physics. 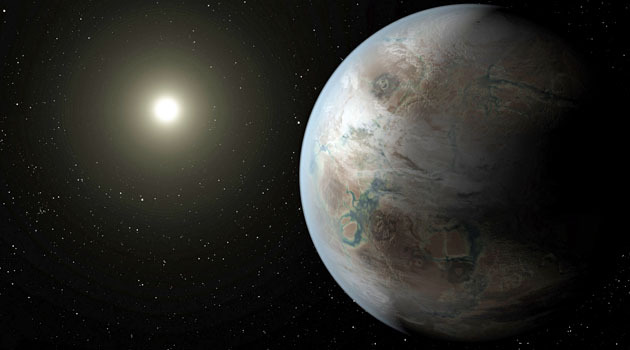 EFI colloquium: Leslie Rogers, "The Diversity and Demographics of Distant Rocky Worlds"
The discovery of exoplanets (planets outside our Solar System) has brought the settings of many science fiction stories within reach of scientific inquiry. Astronomers' ever increasing sensitivity to smaller and smaller planets has opened the opportunity for empirical insights into the nature and demographics of distant terrestrial worlds. Up to what size and mass do planets typically have rocky compositions? How Earth-like are these distant rocky worlds? How common are rocky planets in the Habitable Zones of their host stars? 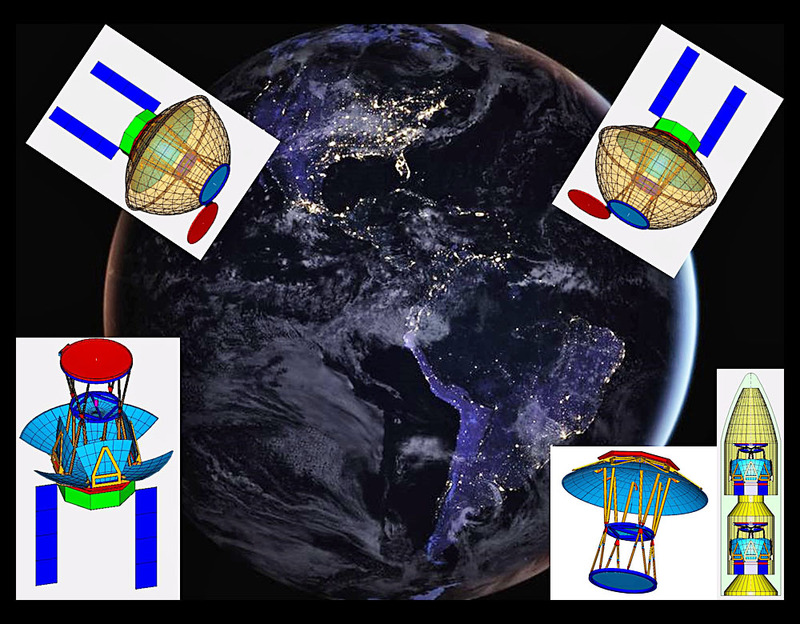 In this talk, I will present the current constraints on each of these questions, appealing both to individual planet case studies and to planet population statistics. 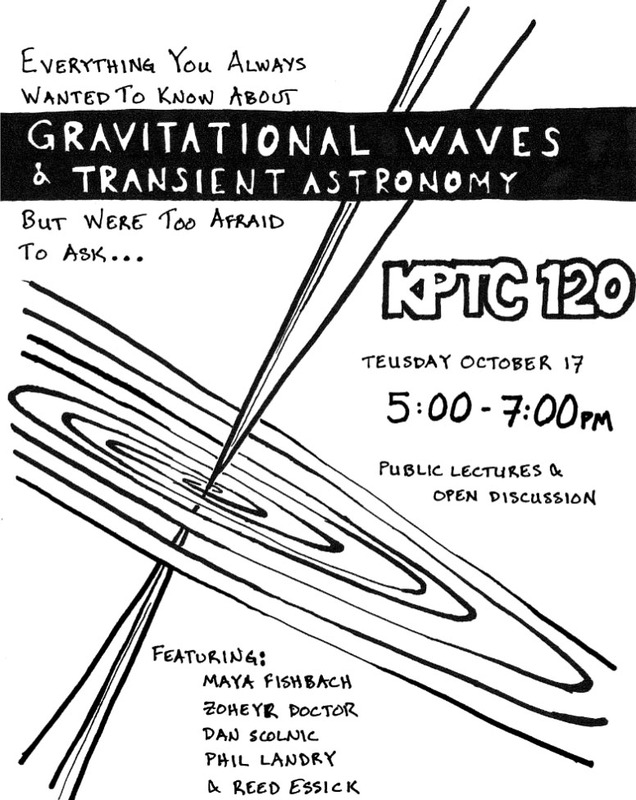 Join The Triple Helix for a discussion with Professor Daniel Holz, who worked on last year's gravitational waves discovery! Learn about what led to the discovery and what further progress has been made in the past year. We will have copies of the newest edition of our Scientia journal available. 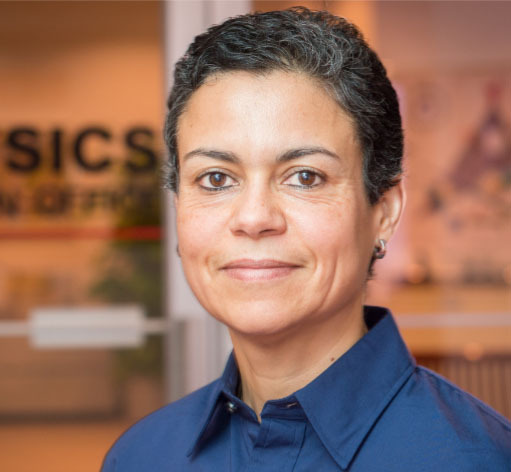 Society of Women in Physics: Dr. Kawtar Hafidi, "A Personal Odyssey: From Africa to America"
Dr. Hafidi will present on her history and career in order to open up discussion about the experiences of women and underrepresented minorities in physics and science. An informal reception and discussion will follow. 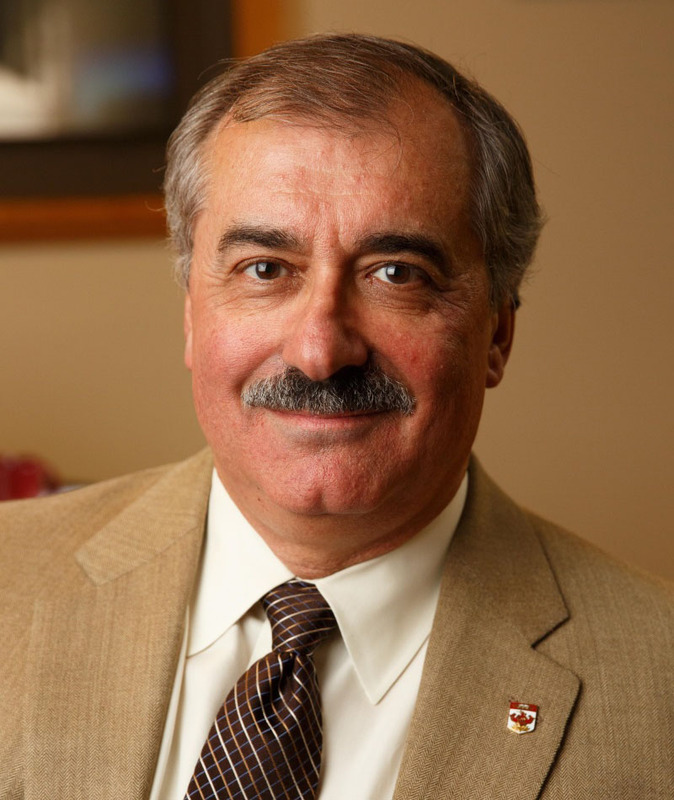 Dr. Kawtar Hafidi is the Director of the Physics Division at Argonne National Laboratory. She is an experimental nuclear physicist who has received numerous awards recognizing her effective advocacy for increased diversity. Previously, she has led Argonne's Women in Science and Technology program and was chair of the American Physical Society's Committee on the Status of Women in Physics. 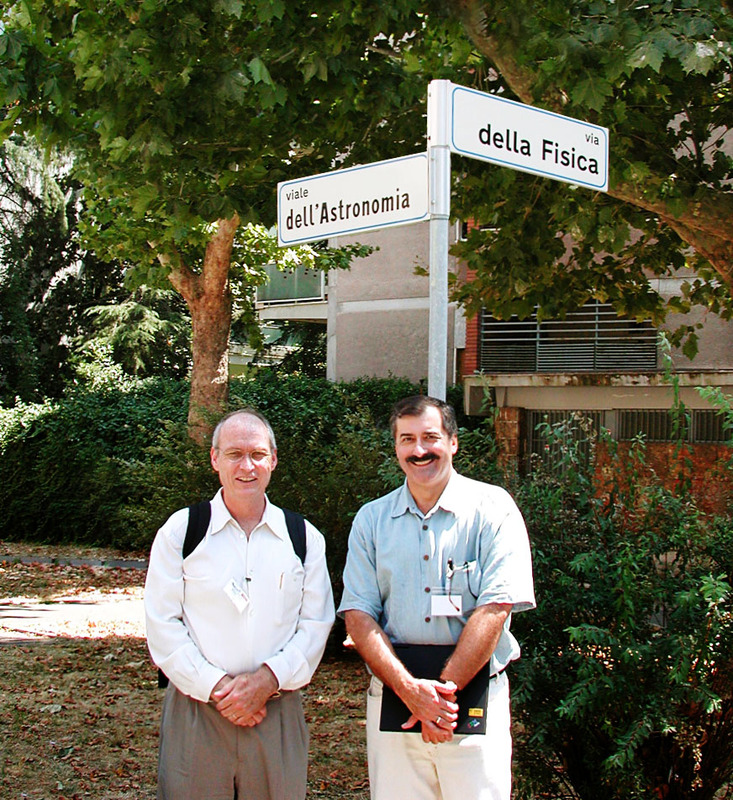 Rocky Kolb and Michael Turner: "How Fermilab changed the course of cosmology"
Shortly before the Fermilab Astrophysics group was created in 1983, cosmology was still the search for two numbers -- H_0 and q_0 -- and very much the province of a small band of astronomers known as cosmologists. Fermilab played the leading role in creating -- indeed was the mother church for -- a new approach, one that involved the fusion of modern particle physics and astronomical cosmology. This fusion resulted in the current cosmological paradigm, with its dark matter, dark energy and early epoch of accelerated expansion (inflation). It also changed the cosmological conversation forever and merged the frontiers of particle physics and astrophysics/cosmology. Along the way, Fermilab hosted the first meeting that brought together particle physicists and astronomers (Inner Space/Outer Space), brought Russian physicist Yakov B. Zel'dovich to Batavia for his first and only visit to the U.S., spearheaded the Sloan Digital Sky Survey and its successor the Dark Energy Survey, and trained many leaders of the field today. 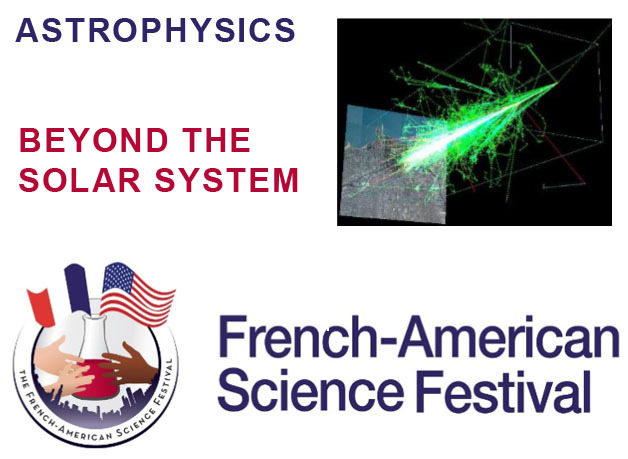 In this special, extended-length colloquium, the current state of our understanding of the Universe, the big, open questions facing both particle physics and cosmology, and the history of the cosmic frontier at Fermilab will be discussed by its two favorite alums and the two most brilliant scientists of their generation. 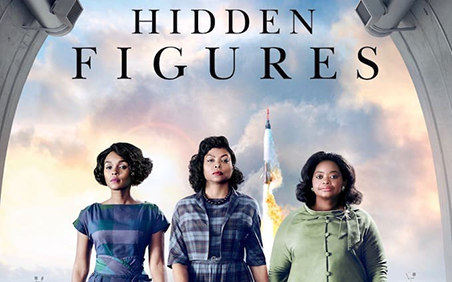 Film Screening and Discussion: "Hidden Figures"
Watch a screening of 'Hidden Figures' and join an expert panel of UChicago female physicists and astrophysicists who will explore the contributions of women of color in science and the current and historical challenges they experience. Panelists are Professor Young Kee Kim, Kavli Institute graduate student Andrea Bryant, and KICP Fellow Camille Avestruz. 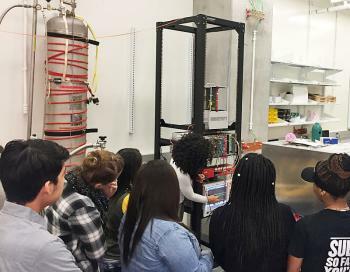 "From Grad School to Government": UC graduate Nicole Fields will discuss her career as a health physicist and how she got there since gaining her PhD. 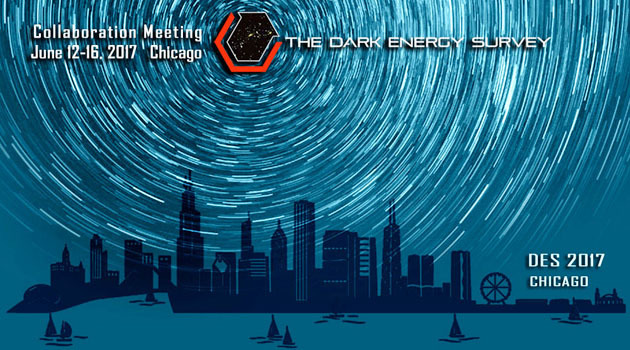 Astronomy on Tap: Zoheyr Doctor, "100 Years in the Making: The Detection of Gravitational Waves"
Join us for a Yuri's Night edition of Chicago Astronomy on Tap hosted by Univ. of Chicago at The Map Room! 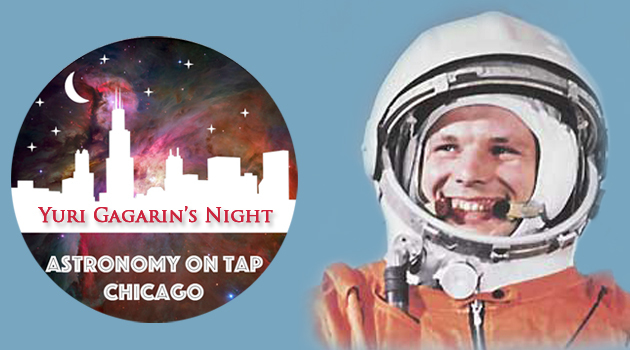 Yuri's Night celebrates the launch anniversary of the first person in space, Yuri Gagarin. Come hear about the history of human spaceflight, research into the ripples of the fabric of spacetime, and updates on the upcoming March For Science. Compete in astronomy trivia to win awesome astronomy prizes, enjoy the 25+ beers on tap at The Map Room, and enjoy an evening with some awesome alcohol-inclined astronomers! Almost two years ago, a ripple in the fabric of space-time, originating from two black holes colliding a billion light-years away, was detected by an international team of scientists. Hear the story of how scientists made this groundbreaking discovery, and about the mind-boggling phenomena physicists and astronomers hope to understand in the coming years. Cafe Scientifique: Abby Vieregg, "Turning a Continent into a Telescope"
Searching for the highest energy particles in the universe requires an extremely large detector, because they are very rare and elusive. 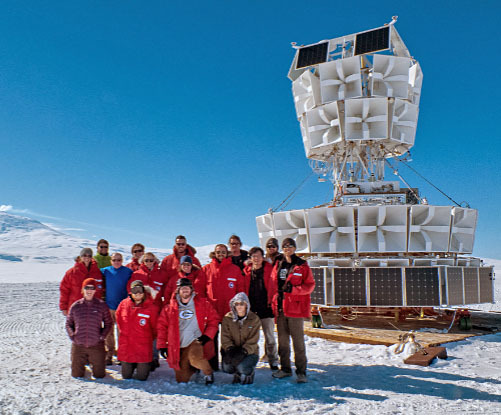 Our hunt for these particles takes us to the bottom of the world - Antarctica - where we can use the entire 14 million square kilometer Antarctic ice sheet as a detector. The particles we are looking for are ultra high energy neutrinos that come from astrophysical sources which are the most powerful accelerators in the universe. At the cafe we will discuss why we search for these high energy neutrinos, how we do it, what we know now, and what we hope to learn in the coming years. EFI colloquium: Adrienne Kolb, "Tunnel Visions: The History of the Superconducting Super Collider"
Thirty-four years ago the US high - energy physics community planned the most powerful hadron collider ever attempted, the Superconducting Super Collider (SSC), a 54 - mile, 20 TeV on 20 TeV proton collider costing $2 - 3 billion. It was proposed to the Department of Energy in 1983. The NAS and DOE conducted a nation - wide site search. Batavia, Illinois was among the finalists, but Waxahachie, Texas won the competition. Initial construction began in 1989, but by 1992 the project was in trouble. After spending nearly $3B, Congress cancelled the SSC in 1993, and Europe seized the energy frontier. 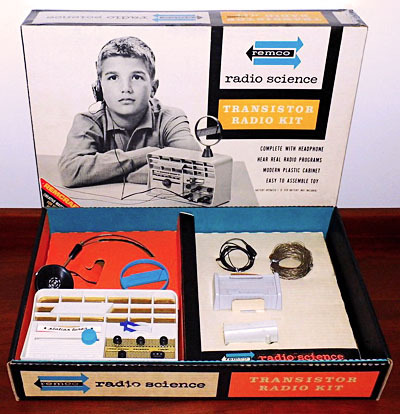 In the talk I will recall the brief history of the SSC featuring highlights and low points of the project described in the author's 2015 book Tunnel Visions, the Rise and Fall of the Superconducting Super Collider, written with coauthors Lillian Hoddeson and Michael Riordan and published in 2015 by The University of Chicago Press. 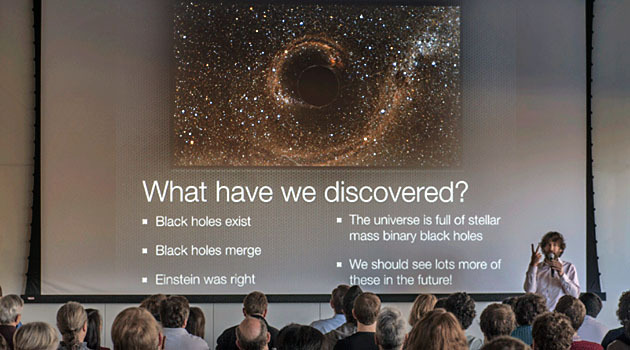 Nergis Mavalvala, "The Warped Universe: the one hundred year quest to discover Einstein's gravitational waves"
Nergis Mavalvala is the Marble Professor of Astrophysics at the Massachusetts Institute of Technology (MIT) and a 2010 recipient of a MacArthur "genius" award. She is a physicist whose research connects the microscopic quantum world with some of the most powerful forces in the cosmos. 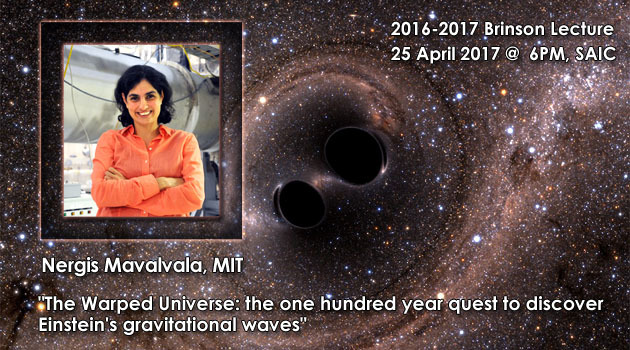 She has worked on the detection of gravitational waves for decades, and is a longtime member of the scientific team that announced the first direct detection of gravitational waves from colliding black holes by the Laser Interferometer Gravitational-wave Observatory (LIGO). Mavalvala has also conducted pioneering experiments on generation and application of squeezed states of light, and on laser cooling and trapping of macroscopic objects to enable observation of quantum phenomena in human-scale systems. Mavalvala received a B.A. from Wellesley College and a Ph.D. from MIT. She was a postdoctoral fellow and research scientist at the California Institute of Technology before joining the Physics faculty at MIT in 2002. 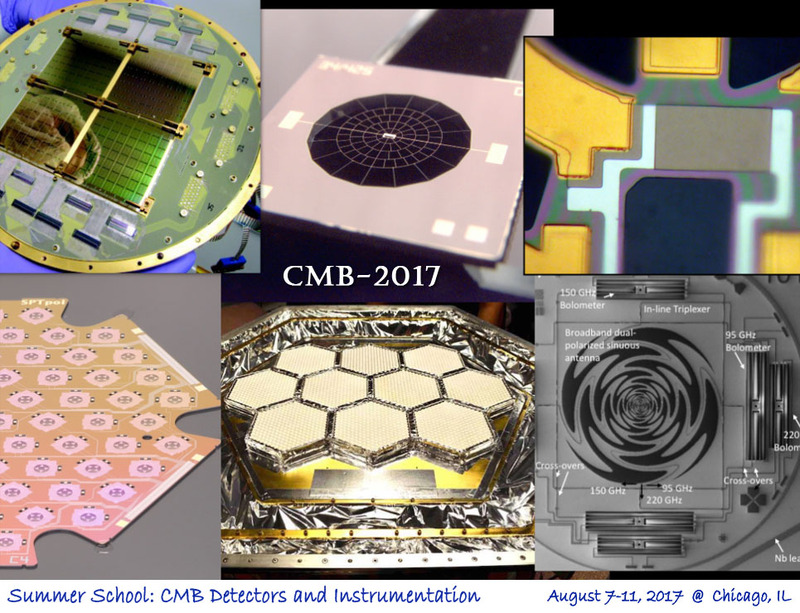 2016-2017 Brinson Lecture: "The Warped Universe: the one hundred year quest to discover Einstein's gravitational waves"
In 2016, scientists announced the first ever detection of gravitational waves from colliding black holes, launching a new era of gravitational wave astrophysics. 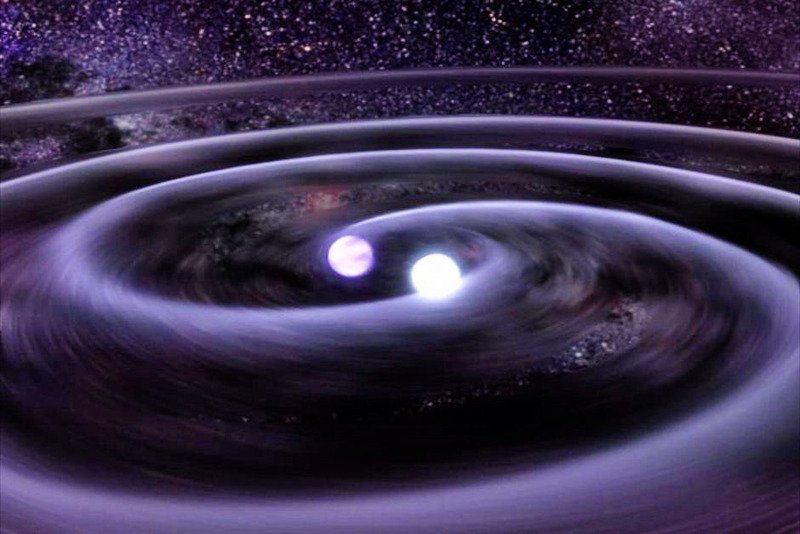 Gravitational waves were predicted by Einstein hundred years earlier. I will describe the scientific and human story behind these discoveries that provide a window into some of the most violent and warped events in the Universe. Computations in Science Seminar: Daniel Scolnic, "Measuring the size of the Universe with Standard Candles"
Astrophysicists use standard candles, objects which have roughly the same luminosity, to infer distances to far-away parts of the universe. Standard candles of variable stars called 'cepheids' were used to discover the expanding universe, and standard candles of exploding stars called 'supernovae' were used to discover the accelerating universe. Together, these two standard candles can be used to measure the size of the universe. Interestingly, this measurement of the size of the universe recovered conflicts with measurements of the size of the universe from extrapolations of data from the Cosmic Microwave Background. I will go over how we make our measurement, from soup to nuts, and discuss how we can be confident in the accuracy of our values. I will then discuss different ways too explain the tension we see in the different sets of measurements, and possible new physics that may be on the horizon. Jonathan Richardson, "Performance of the 40m Bent-Arm Holometer Interferometers"
Nadia Marounina, "Role of the global water ocean on the evolution of Titan's primitive atmosphere"
Dan Scolnic, "The LSST SNIa Revolution?" NASA will make an announcement on the first spacecraft to fly directly into the sun's atmosphere during a ceremony Wednesday, May 31 at the University of Chicago honoring Eugene Parker, professor emeritus in the Department of Astronomy and Astrophysics at UChicago. Four of the key scientists involved in this mission will participate in a panel discussion about the science on Tuesday, May 30, at 4:30pm in ERC 401. Solar Probe will plunge through the sun's atmosphere, closer to the surface than any spacecraft before it, providing humanity with the first-ever close-up view of a star. The satellite will use seven Venus flybys over nearly seven years to gradually reduce its orbit around the sun, coming as close as 6.2 million kilometers to our star, well within the orbit of Mercury and more than seven times closer than any spacecraft has come before. Flying into the outermost part of the sun's atmosphere (e.g., the corona) for the first time, Solar Probe will employ a combination of in situ measurements and imaging to revolutionize our understanding of the corona and expand our knowledge of the origin and evolution of the solar wind. It will also make critical contributions to our ability to forecast changes in Earth's space environment that impact life and technology on Earth. A celebration of Professor Emeritus Eugene Parker's contributions to astronomy and astrophysics sponsored by UChicago and NASA. 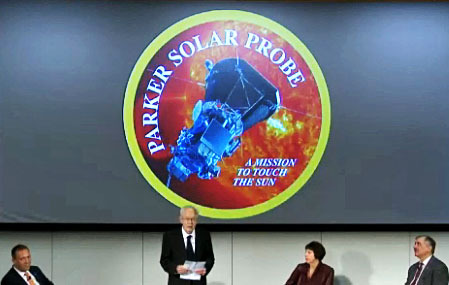 The event will feature an announcement about the first robotic mission to touch the sun. 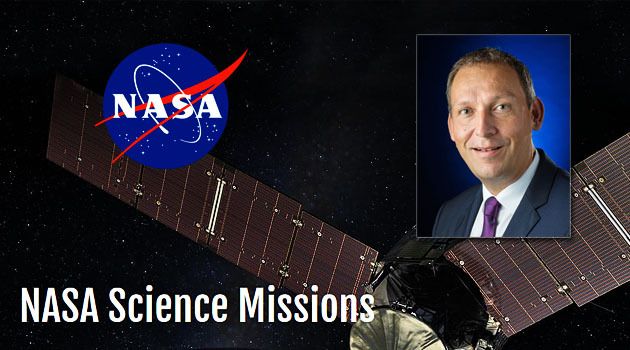 Dr. Thomas Zurbuchen, NASA Associate Administrator for the Science Mission Directorate, "NASA Science Missions"
NASA Associate Administrator for the Science Mission Directorate Dr. Thomas Zurbuchen will be visiting next Wednesday May 31. He will be giving a short presentation about NASA Space Science and answering questions about NASA and its science program. This is a wonderful opportunity to hear directly from the individual who directs NASA's Science program, as well as asking questions and expressing your views. He is especially interested in meeting and hear from graduate students and postdocs. Michael Turner, "The origin of our universe: what we know for sure and the big mysteries"
We can trace the evolution of our Universe back 13.8 Billion years, to within a microsecond of a big bang beginning. At that early time, all that we see today existed as a hot, slightly lumpy quark soup. We are trying to answer even bigger questions today, e.g., the nature of the dark matter and dark energy that steer the evolution of the Universe, and extend our understanding even further back, even addressing what happened before the big bang. Compare the movie's hero astronaut, Scorch Supernova, to critters walking our planet. See yourself as a South Pole explorer in our selfie booth. 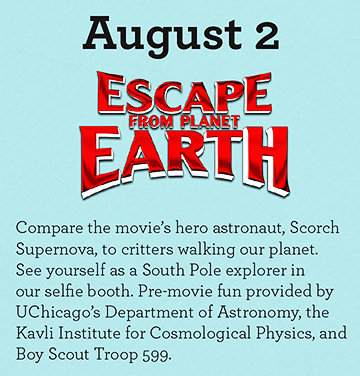 Pre-movie fun provided by UChicago's Department of Astronomy and Astrophysics, the Kavli Institute for Cosmological Physics, and Boy Scout Troop 599. The Department of Astronomy & Astrophysics at the University of Chicago cordially invites you to attend the RosnerFest - a 70th birthday celebration for Robert Rosner. Welcome to the Fall Quarter! We'll have a set of slides, based on screen shots of the department directory, to prompt everyone when it's their turn to stand up and introduce themselves. Please see the attached example of what each default slide will look like. If you would like to make your own slide (funny pictures are welcome) and/or if you're not yet in the directory please send us a pdf of your slide by 10am Sep 26 morning. Pizza will be served! So come on down to the Hubble Lounge Sep 26 at high noon! Each Senior Member will receive 90 seconds and be allowed 1 or 2 (no more!) powerpoint slides to briefly introduce themselves and their research. All Fellows, Associate Fellows, and Senior Researchers will receive 60 seconds and 1 powerpoint slide. We would also like to request that KICP Graduate Students briefly introduce themselves. Join us for a round table discussion with Berlin-based Argentinian artist Tomas Saraceno and UChicago professors Angela Olinto, Daniel Holz, and Heinrich Jaeger, moderated by Zachary Cahill, Curator for the Gray Center for Arts and Inquiry at UChicago. Berlin-based Argentinian artist Tomas Saraceno will be in residence at the University of Chicago to meet with scientists from the Department of Astrophysics & Astronomy, the Kavli Institute for Cosmological Physics, the Enrico Fermi Institute, and the Center for Soft Matter. Saraceno's recent research and new experiments are inspired by the cosmological dimension, both by sub-atomic environments as well as celestial bodies. He will be interacting with astrophysicists, cosmologists, and soft matter physicists to investigate their research and inquiry methods, with a particular focus on cosmic dust. As a result of this residency, all participants will gain a greater understanding of experimenting with structural forms and the physical properties embedded in the natural world, along with first-hand insight into Saraceno's visionary translation of these concepts into sculptural form. Tomas Saraceno's oeuvre can be seen as an ongoing research, informed by the worlds of art, architecture, natural sciences, astrophysics and engineering; his floating sculptures, community projects and interactive installations propose and explore new, sustainable ways of inhabiting and sensing the environment. In 2015, Saraceno achieved the world record for the first and longest certified fully-solar manned flight. During the past decade, he has initiated collaborations with renowned scientific institutions, including the Massachusetts Institute of Technology, Max Planck Institute, the Nanyang Technological University of Singapore, and the Natural History Museum London. He is the first person to scan, reconstruct and reimagine spiders' weaved spatial habitats, and possesses the only three-dimensional spider web collection to existence. Saraceno lectures in institutions worldwide, and his work has been widely exhibited internationally in solo and group exhibitions. 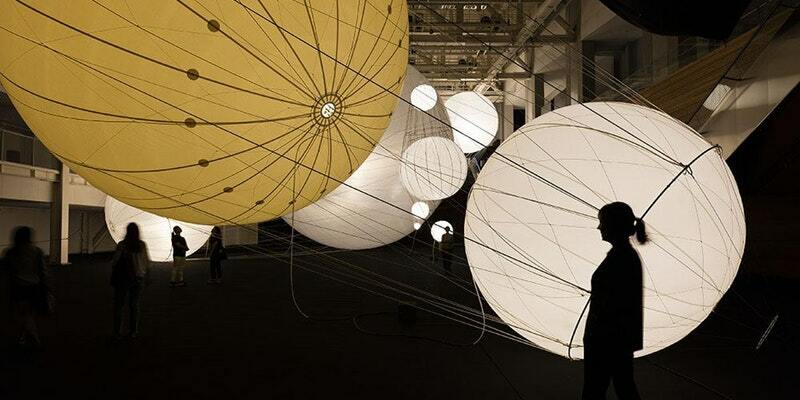 Saraceno lives and works in and beyond the planet Earth. Daniel Holz, UChicago, "Update on Gravitational-Wave Astronomy"
We will discuss some of the interesting findings from LIGO/Virgo's second observational run, which concluded at the end of August. Joshua Freeman, UChicago, "Update from DES and DECam"
We will discuss some interesting findings from DECam, related to LIGO/Virgo's second observational run. The colloquium will be followed by discussion and comments by: Holz, Frieman, Hubble Fellow Dan Scolnic, University Professor Wendy Freedman, and students and postdocs involved in the new findings. Livestream of LIGO press conference will be shown in ERC Lobby (Video Wall) and PRC 201, 9:00-11:00 a.m.
Andrew Long, "WIMPzillas through the Higgs Portal"
Kimmy Wu, "Constraining Inflation with BICEP/Keck Array and the South Pole Telescope"
Macarena Lagos, "Landscape of cosmological models"
Kirit Karkare, "Beam Systematics in Degree-Scale CMB Polarization Measurements"
Reed Essick, "Challenges and opportunities from routine gravitational wave detections"
Dr. Smith has a broad range of expertise in the physical sciences with a particular focus on the development of instrumentation and hardware required to detect high-energy radiation (X-rays, gamma rays), and its interaction with matter. 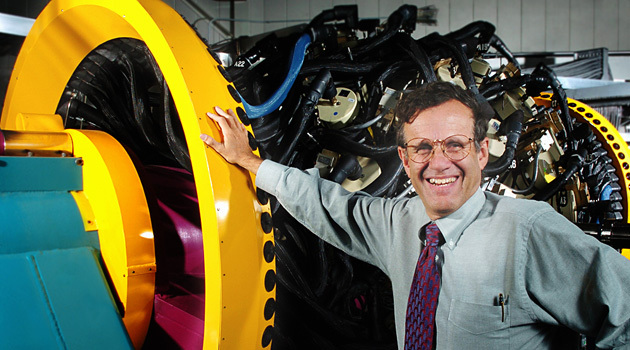 Dr. Smith's extensive background in detector technology, that includes work in modeling and developing detector packages (using both solid state and scintillating crystal detectors), characterizing light detectors (photomultiplier tubes and avalanche photodiodes), and the commissioning of fast (nanosecond scale) signal processing and communication electronics. During his postdoctoral work at Argonne National Laboratory, he was part of an engineering team that designed, installed, and commissioned a FPGA based trigger module for use in ground based gamma-ray telescopes, significantly improving their noise rejection. 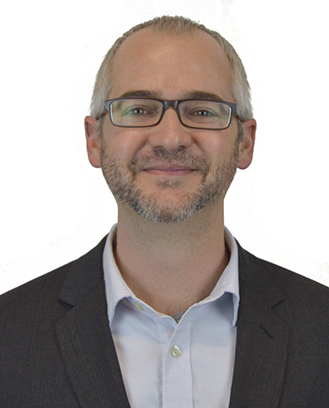 Additionally, through his participation in multiple astronomical facility construction projects, Dr. Smith has gained a background in the mechanics of large optical support structures, missile positioners, and coating/degradation processes in mirror surfaces. 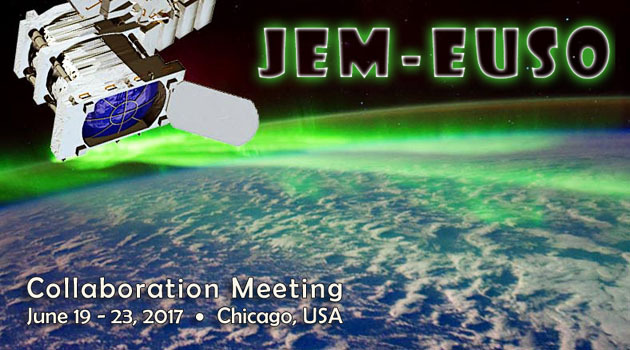 Tomorrow we are hosting a Chicago-area Exoplanet meeting, all day. It will be held in ERC 401. If you are not in the subfield, you are still invited to pop in for any of the talks to get a taste of the exciting science. Talks are just 15 min so you will get a great sample quickly! Participants are invited at 9 am for coffee, pastries, and greetings, and the schedule begins promptly at 9:30; see below. Fred Ciesla (UC), "Particle Transport, Growth, and Chemical Evolution in Protoplanetary Disks"
Sebastiaan Krijt (UC), "The effect of pebble formation & migration on the volatile budget of protoplanetary disks"
Seth Jacobson (NU), "How the pebble flux controls the growth dichotomy between tightly packed systems and the Solar System"
Adam Dempsey (NU), "Pile ups around planets in accretion disks"
Wing Kit Lee (NU), "Slow eccentric modes in Self - gravitating disks"
Arieh Konigl (UC), "The gravitational interaction between planets on inclined orbits and protoplanetary disks"
Richard Lyons (UC), "Impact effects on cooling rates of iron meteorites"
Sourav Chatterjee (NU), "Effects of Dynamical Processes on the Structures of Sub-Neptunes"
Diego Munoz (NU), "Planet Engulfment as a Trigger for White Dwarf Pollution"
Max Goldberg (UC), "Finding Circumbinary Planets with Eclipse Timing"
David Martin (UC), "Circumbinary planets - moving forward"
Greg Gilbert (UC), "Kepler-603: A non-transiting planet perturbing its transiting neighbors"
Ben Nelson (NU), "Quantifying the Evidence for a Planet in Radial Velocity Data"
Ben Montet (UC), "Observing Stellar Activity Cycles with Kepler"
Megan Mansfield (UC), "A thermal inversion in the atmosphere of HAT-P-7b"
Jade Checlair (UC), "Empirical tests for the habitable zone concept"
Howard Chen (NU), "Modeled 3-D Biosignatures from Proxima Centauri b"
Edwin Kite (UC), "Habitability of exoplanet waterworlds"
Kathryn Chapman (UC), "Secular Instabilities on Gigayear Timescales"
Children, families, students and teachers are all invited to attend this annual holiday lecture and open house at the Kresten Physics Teaching Center at the University of Chicago. 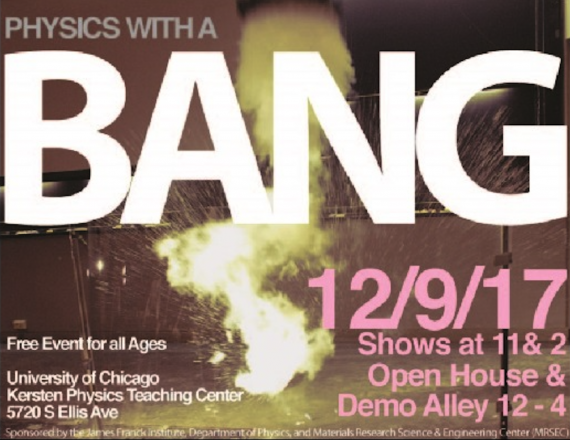 Graduate students, undergraduate students and professors are going to perform breathtaking physics demonstrations with a bang. 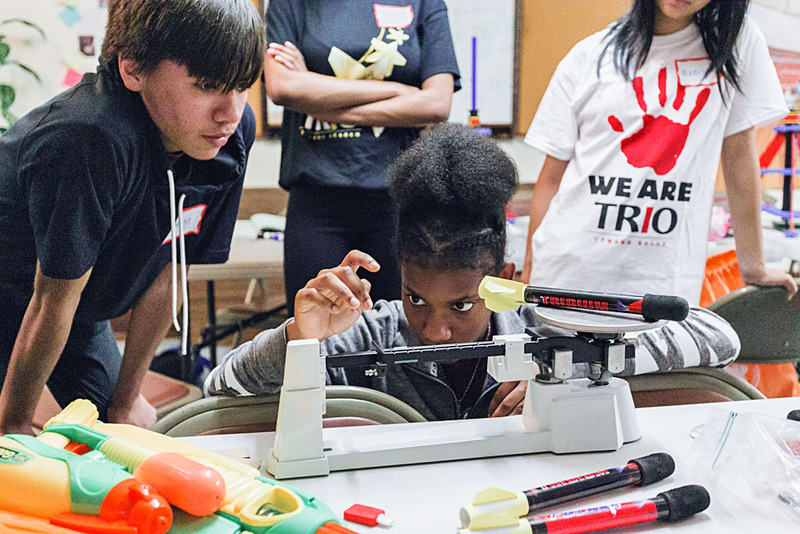 Participants could also take part in many hands-on activities relating to various topics in physics.